The episode starts with mata brahmari flying across the lava to find arunasura. arunasura is invisible using his powers, he says this brahmari wont be able to find me because now I am invisible, I will eat her. Arunasura is spotted by mata brahmari and she says stupid demon, did you think I cannot see you? you are totally visible to me. Arunasura uses his tongue on mata brahmari, she dodges and arunasura takes his demon form and says filthy brahmari, you will die. Mata brahmari says we will see about that. mata brahmari attacks on arunasura. arunasura attacks with his tongue and he holds mata brahmari and bounds her. Mata brahmari uses her powers and frees herself. She then attack 2 pillar near arunasura. both pillars fall on arunasura and he holds them using his hands. Arunasura attacks his tongue and mata brahmari flies as the tongue follows her. Ganesh says father, with mata’s every form, you have always taken a form to support a male alter ego as well. Wont you go now? mahadev smiles and he goes to take an avatar with devi brahmari. Devi brahmari flies around the first pillar and arunasura’s tongue follows mata. Mata flies around the 2nd pillar and this way she entangles arunasura’s tongue around himself and ties it. arunasura says brahmari, you tricked me. durgamasura gets angry and says this foolish arunasura said he could defeat anyone! Mata brahmari says evil demon, you did many sins and thought so less of this world and the universe’s living beings. Mata says I took this form to show the world that nothing is filthy and unworthy, even the smallest being in the universe can withhold great power. Mata brahmari takes her divya avatar of The brahmari form. She stands tall dressed in black with her makeup black as well, with small brahmari bees flying around her. The world prays to mata’s divya brahmari avatar. All gods do pranam and ganesh and kartikeya do pranam. to support mata, mahadev appears and takes the great lotsu avatar and mata brahmari smiles and says swami, you?! mata is happy and she sits on the great lotus completing the avatar of Devi brahmari. Mata then uses her sound and attacks brahmari sound waves on arunasura. arunasura screams in pain, mata then attacks him using her sting of the brahmari and she inserts it into arunasura’s chest, arunasura screams one last time and dies! Durgamasura is angry and he says no! this adishakti, killed arunasura too. Now what do I do? I have to do something otherwise soon I will be killed too. Durgamasura prays to Nimavata avatar of mata adishakti in front of the fire. Durgamasura prays to summon mata to seek help. All gods, ganesh and kartikeya and tridev appear. Everyone pray to mata’s Brahmari avatar and ganesh says father and mother together have taken another avatar. Mother now only durgamasura has to be killed, then this quest shall be over. Precap: Durgamasura prays to mata’s nimavat avatar. He screams and says come and help me mata, help me. mata is forced to appear. 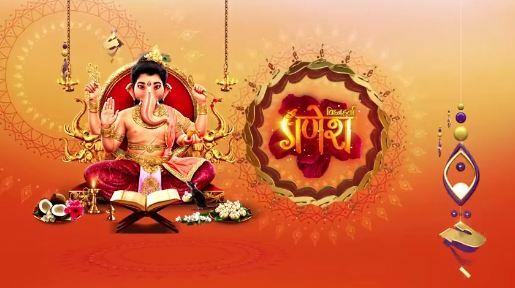 The post Vighnaharta Ganesh 25th February 2019 Written Episode Update: Arunasura is killed by Mata Brahmari. appeared first on Telly Updates.